Microsoft, Yahoo and Google and others were tarred by PRISM after exposed for providing data to the US spying program, and that’s helped lesser search rival DuckDuckGo record its best-ever day of traffic with 2.35 million search requests made on Wednesday. For those not familiar with it, DuckDuckGo provides ‘private’ Internet searches. That means that the company does not track users in the same way that the big listed above do, and is instead focused purely on results. It does serve Google-like ads, but without the customization. As VentureBeat reports, Wednesday’s haul was an impressive 26 percent rise increase on the number of searches made via the service one week previous. DuckDuckGo’s own data — includes a refreshing transparent set of statistics showing traffic broken down by daily and monthly rates — shows a consistent rise in usage in recent times. 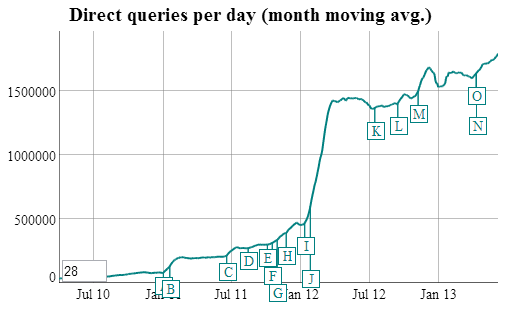 It racked up its first million search day back in February 2012. That growth isn’t solely down to PRISM-related privacy concerns, since DuckDuckGo has been ramping up its media efforts of late. The service was recently profiled in the Washington Post and founder Gabriel Weinberg appeared on CNBC in April and Bloomberg this week. Speaking in the later interview, Weinberg claimed that it was “a myth” that Google made money by tracking people on search. [Google] needs to track you for another reason, they have all these other services — Gmail, YouTube, etc — that they have trouble monetizing. They use your information there to serve ads for you across the Web. If the FBI or NSA comes to us, we have nothing to tie back to you. Weinberg says around half of DuckDuckGo’s users are based in the US, with most of the rest based in Europe. The company has multiple servers based worldwide, and has attracted investment from Union Square Ventures — raising a $3 million round in 2011.